Do you cover your portable devices, from smartphones to tablets to portable hard drives? These devices are getting tougher, with more scratch-resistant (and fingerprint-resistant) screens. And Apple has the cool Smart Cover for the iPad that snaps on magnetically to protect the screen. But there are still good reasons for using a protective case, from soft rubberized covers to provide some help when knocking around in a pocket or bag (and to provide a more secure grip), to hard shells for added security with rougher use. There are zillions of cases out there, but Speck has a particularly nice variety of smart and playful designs. The Speck PixelSkin is a soft protective silicon case with a pixilated raised grid design for a good grip (see earlier post). It's joined by the more rigid PixelSkin HD with a higher contrast texture. The PixelSkin for the iPhone 4 / 4s is $24.95, the PixelSkin HD $29.95 for the iPhone 4 / 4s and the PixelSkin HD Wrap for the iPad 2 is $49.95. The Speck CandyShell is a hard case with extra protection from rubberized corners and inner rubbery lining (see earlier post). 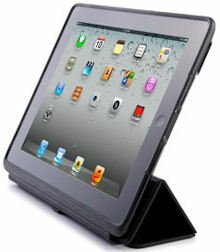 The CandyShell Wrap for iPad 2 ($54.95) provided hard-shell protection, with a removable cover. The case is co-molded with the hard polycarbonate plastic shell and soft rubber insides. It protects the back and sides, including rubberized covers over the buttons. And it has a flip-out panel on the bottom for use with dock or keyboard. The front cover stays closed with micro-suction, and folds to serve as a multi-position viewing and typing stand -- or you can remove the cover by sliding it out for intensive use. LED lighting has really taken over, from bright flashlights (see earlier post) to Christmas string lights. LED provides bright light without heat, uses less energy, and lasts longer. Or LEDs can be dimmer and flickering, as in the new Energizer Flameless Candle line. These have integrated candle and holder, with 4-inch and 6-inch sizes, in the Glas rounded design and Edge more contemporary square look. These provide a warm glow with a realistic flickering effect -- a gentle flicker, not anything dramatic -- with no flame, no soot, wax, or smoke. The Flameless Candles are powered by three AA batteries, and last up to 300 hours, although there's an automatic timeout to turn off after 4 hours. The lights are hidden in the base, so there are no fake wicks or visible bulbs. The Glas candles are available for around $17 in the 4-inch height, and $18 for the 6-inch. The new Corel MotionStudio 3D offers great power for adding 3D text and graphics animations to your video productions - with animated extruded text, flying and exploding 3D objects, and naturalistic fire and smoke. Even better, it is designed for enthusiast video editors, with an accessible interface to help you quickly create sophisticated animations from pre-built components, and it's priced at only $100. MotionStudio 3D comes with an extensive library of more than 140 pre-defined objects, including spinning globes, turning gears, and flying spaceships. Then you can select from hundreds of materials, object styles, and animated effects to customize the objects in the scene. Plus, all this power also works with 3D animated text, plus particle effects including bubbles and snow. After you assemble your scene, you can add global effects, including lightning, fireworks, and clouds, and add realism with lens flares, shadows, reflections, motion blur, and even depth of field. Then set the final scene view with backgrounds, global lighting, and camera settings. Of course, you also can dig in further to customize the object attributes and fine-tune the keyframed animation. But all the heavy lifting of setting up the objects, attributes, motion, and scene can be done as simply as drag and drop from the library. Underneath, MotionStudio 3D is built on a core of a quite powerful traditional 3D modeling and animation tool. You can import and export 3D geometric models in common modeling formats (DirectX and 3D Studio), build complex models from scratch with detailed materials, and combine objects into hierarchical structures (such as tires on a car). You then can keyframe animate the object shapes and motion, and build entire 3D scenes, complete with lighting and camera control. Corel MotionStudio 3D is an impressive re-packaging of traditional 3D modeling into a nicely accessible tool for video editing enthusiasts. You can create quite effective text and graphics animations without being a 3D expert by using the supplied models, styles, and effects. And the underlying 3D modeling architecture provides lots of headroom to further customize your productions with your own objects, textures, and motions. This is the year for 3D, and Sony Creative Software has stepped up with Sony Vegas Movie Studio HD Platinum 11, with import from 3D video and still image formats, editing and previewing on 3D monitors, or on standard monitors with red/cyan glasses, and sharing on YouTube 3D or Blu-ray 3D disc. It also adds improved GPU-accelerated AVC rendering, support for more progressive HD project formats, title and text animations and effects, and other workflow improvements. Sony has continued its legacy of providing a family of consumer applications instead of a single integrated tool, with DVD Architect Studio 5.0 for DVD and now Blu-ray authoring included with Movie Studio HD Platinum, plus the separate Sound Forge Audio Studio for audio editing and production ($65), and ACID Music Studio for music creation and mixing ($65). Movie Studio is offered in several versions and bundles: The base Movie Studio HD 11 is focused on easy editing and sharing for HD media ($50). Movie Studio HD Platinum 11 supports higher-end features including 3D editing, GPU-accelerated AVC rendering, color correction, 5.1 audio, and disc authoring ($100). The Movie Studio HD Platinum 11 Production Suite bundles Audio Studio and more effects ($130). The Imagination Studio 3 bundle completes the set with Music Studio and Photo Go ($180). Movie Studio helps casual users get started with Show Me How tutorials, wizards for easy sharing online, and extensive collections of templates, themes, and soundtracks. But Sony's focus with Movie Studio is not so much on organizing and combining clips, it's on refining a production through precise control of the assembly and animation of your clips. Amazon has released an upgrade to the Amazon Kindle Fire tablet, Update 6.2.1, saying it "enhances fluidity and performance, improves touch navigation responsiveness, gives you the option to choose which items display on the carousel, and adds the ability to add a password lock on Wi-Fi access." There have been a variety of complaints about the Kindle, highlighted in particular by a recent article in the NY Times: As Kindle Fire Faces Critics, Remedies Are Promised (12/11/11) -- note the URL reflects the apparent original title, "amazons-fire-some-say-may-become-the-edsel-of-tablets.html", which is seriously overblown. The listed complaints include: "there is no external volume control. The off switch [on the bottom] is easy to hit by accident. Web pages take a long time to load. There is no privacy on the device; a spouse or child who picks it up will instantly know everything you have been doing [especially in the home screen Carousel]. The touch screen is frequently hesitant and sometimes downright balky." Yes, the Fire was a tad sluggish in responding to touch input, and the new update does make it snappier. David Pogue in the Times applauds the improvements, and lists his remaining key issues. And, yes, it would be nice to have a whole bunch of additional features at the same price -- including physical volume controls (to shush it when you get a phone call), Bluetooth, GPS, and camera / microphone. And the new update addresses the "privacy" complaint by allowing you to remove items in the home screen Carousel display of your most recently used apps (and media and web pages) -- just press and hold, then select Remove so others can't see what you were recently doing. But note that the home screen is the least of your problems if you're seriously concerned with privacy, since your Fire is tightly linked to your Amazon account (just as your iPad is linked to your Apple account). Looking at your phone or tablet exposes a lot more about your personal purchases and collections of books, music, video, apps, documents, and Web bookmarks -- plus other customized settings in your apps, including stored logins to various sites like Facebook. Loaning a personalized tablet or smartphone is like loaning a laptop -- you're going to expose a lot of personal data, especially with links to on-line accounts and storage. Another concern about the Fire is that it has limited storage (8 GB, with only around 1 GB for user data). The Fire is instead designed to off-load the need for local storage by accessing content via the on-line cloud. Others may object to the limited selection of apps, which are officially available only though the Amazon Android store, so many of the Google apps are not available, including Google Maps and syncing with online Gmail, Calendar, and Contacts. Interestingly, however, there is a work-around for this, described by a PC Mag article on How To Run Almost Any Android App On the Kindle Fire. You can back up Android apps on other devices using apps like Astro File Manager, transfer the resulting APK files by USB to your computer and then to the Fire, and then restore and install them on the Fire with the Easy Installer app. This seems to work with a variety of apps, although not those requiring a Google login. For example, you can run Google Maps on the Android, and even cache files (download map regions for off-line use), but you can't log in to save preferences. A final perspective on the Fire comes from usability expert Jakob Nielsen's Kindle Fire Usability Findings, which is focused on the importance of updating and optimizing applications for the new 7-inch screen size (compared to smaller 3.5" phones and larger 9.7" full-size tablets). His summary is that "Mobile web sites work best on the 7-inch tablet. Users had great trouble touching the correct items on full sites, where UI elements are too small on the Fire screen." The bottom line is that the Fire is targeted to casual users interested in keeping in touch with Web and email, and in enjoying media content -- especially for accessing Amazon content across PCs, the Fire, and other portable devices. It's not an iPad, nor is it priced in that category, but it's a tremendously attractive device for its intended use. It's inexorable -- computing power is cramming into smaller and smaller devices, as our tools become more and more intelligent and connected. We now expect smartphones to deliver serious computing power and capacity for running rather interesting apps. And now the same kinds of features and even programmability are coming to Bluetooth headsets. For example, the Plantronics Voyager PRO HD Bluetooth headset has voice prompts, automatically picks up a call when it senses it is put on your ear, and supports the Plantronics MyHeadset apps to update and customize its functions. The Voyager PRO HD is the latest iteration of this well-established over-the-ear design (see earlier post). It rests comfortably on your ear, so it's particularly good for extended use, whether moving around at the office or in the car. The new "HD" designation refers to support for high-quality streaming audio -- With a Bluetooth wireless connection to today's smartphones, you may find yourself spending much more time listening to audio playback then you do talking on the phone. Bluetooth also provides control signals between the headset and the phone, so you can press the buttons to play or mute the music, answer a call, transfer the call between the phone and the headset, and even activate voice dialing (or the Siri intelligent personal assistant on the iPhone 4S). The Voyager also displays a battery meter on the iPhone or Android 3.0+ display. The addition of voice prompts is also quite helpful -- they are much better than trying to count beeps or track tones in order to check the headset power level / talk time, or to confirm the volume level or Bluetooth connection. But the coolest intelligence in the Voyager PRO HD is the Smart Sensor technology that senses if the headset is being worn, or has been placed on your ear or taken off the ear. For phone calls, it can answer a call when you put on your ear, and send the voice back to the phone if you take it off. Or when you're playing streaming audio, it can pause the music when taken off, and restart when you put it back on your ear. This is impressive stuff -- it doesn't always work, but it works well enough to be quite useful. Finally, apps are coming to Bluetooth headsets. Instead of having to load a new ROM to add new features, or tap secret button sequences to change settings, you can simply download new apps to modify the built-in functionality. The Plantronics MyHeadset apps are available for Andoid, iPhone, and Blackberry. You can change settings including the language, sensors, or streaming audio. And you can download apps including InstantMeeting for one-touch connection to conference calls from your calendar and the Plantronics Vocalyst service for voice-controlled actions and information (something like Apple's Siri). So the Plantronics Voyager PRO HD is a welcome update to this venerable product. It's available for under $99 for more comfortable use when talking -- and listening. Entries posted to Manifest Tech Blog in December 2011, listed from oldest to newest.